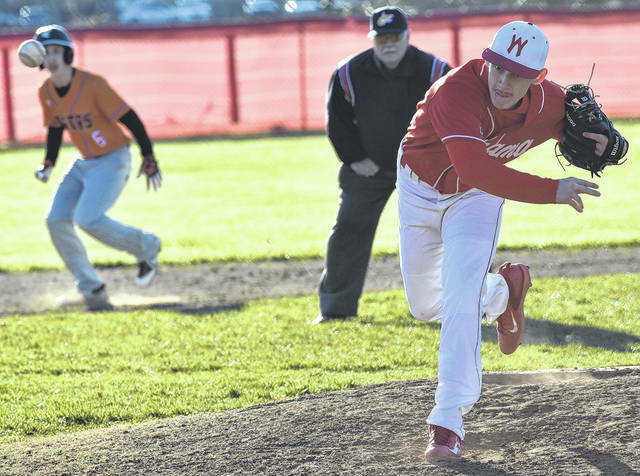 Wahama junior Tanner Smith (5) delivers a pitch in the top of the fourth inning of the White Falcons’ 13-2 victory over Wirt County on Friday in Mason, W.Va.
WHS junior Antonio Serevicz (15) slaps a double in the bottom of the fourth inning of Wahama’s 13-2 win over Wirt County on Friday in Mason, W.Va.
MASON, W.Va. — If stealing bases were a crime, Wahama would indeed be a repeat offender. 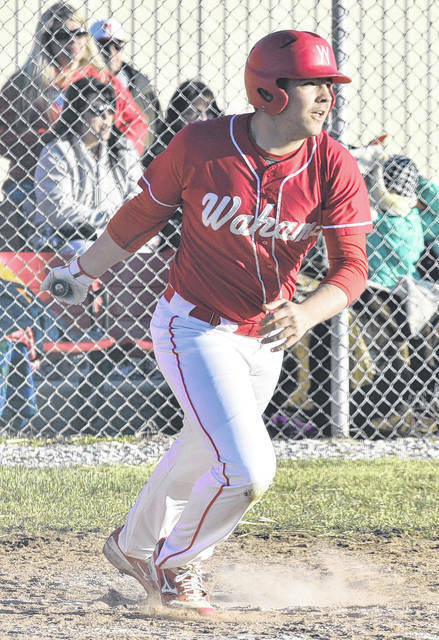 The Wahama varsity baseball team earned its second victory on Friday night, as the White Falcons were aggressive both on the base path and at the plate en route to a 13-2 win over Wirt County at the friendly confines of Claflin Stadium. The White Falcons (2-0) combined for 13 hits, six walks, and swiped 11 stolen bases to earn a season sweep over the Tigers (0-2) — having previously defeated the Orange and Black by a final of 14-2 on March 19. The White Falcons soared to a 1-0 advantage in the opening inning, as David Hendrick drew a walk and later scored on a ground out to first base by Colton Arrington. Wahama added two more runs in the bottom of the second, as a single by Anthony Ortiz and walk by Trevor Hunt with one-out provided the hosts the opportunity to capitalize on an error by Wirt County to extend the lead to 3-0. The Red and White tacked on three additional runs in the bottom of the third inning to push the advantage to 6-0. Arrington, Antonio Serevicz and Ortiz each scored in the third frame — as the hosts sent eight hitters to the plate — to end Wirt County starting pitcher Adam Thompson’s night on the mound after just two and one-third innings of work. The Tigers woes continued in the bottom of the fourth inning, as Wahama 11 batters to the dish and plated seven runs to take a 13-0 lead. Wirt County plated two runners in the top of the fifth inning by way of a single, two walks, two hit batters and an error, as the White Falcons closed out the victory by way of 10-run rule in the fifth. Serevicz was the winning pitcher of record for Wahama, as he allowed no runs, one hit, while striking out six. Serevicz also proved mighty at the plate, with two hits in the contest, including a double, while scoring and driving in a run. Tanner Smith appeared in one inning of relief for the Red and White, surrendering a single and fanning one. Jonathan Frye pitched one frame allowing two runs and recording one strikeout. Smith led the White Falcons with three hits, followed by Tyler Bumgarner, Serevicz and Ortiz with two hits apiece. Dalton Kearns, Hendrick, Arrington and Bryton Grate each had one hit each. Following the game, Wahama head coach Billy Zuspan was pleased with his team’s effort — particularly with the effort by his pitching staff. “I was really happy with the way Antonio came out and pitched,” said Zuspan. “I thought he came out and gave us three solid innings, which was what I was hoping for. I feel like we have a really good pitching staff and we have several kids we are going to depend on to throw and give us good quality outings throughout the season. Coach Zuspan also discussed his squads effort at the plate and ability to steal bases throughout the contest, but noted it there was also room for improvement in areas. The White Falcons returned to action Monday when they host South Gallia in a Tri-Valley Conference Hocking Division contest.